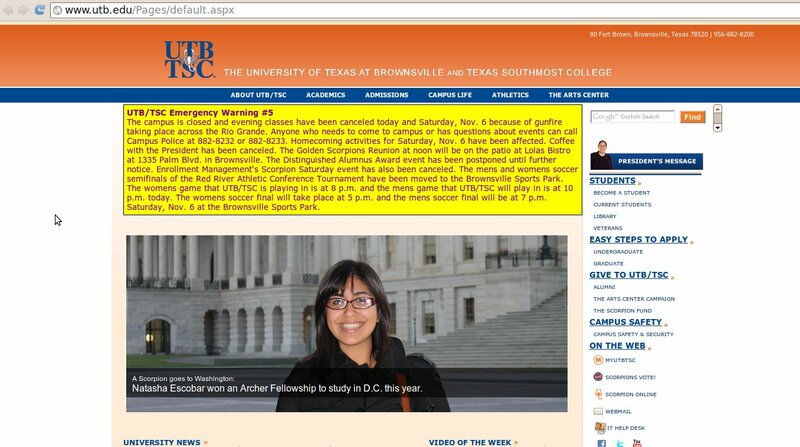 Gunfire across the Rio Grande has caused the University of Texas Brownsville to close its doors. The campus is closed and evening classes have been canceled today and Saturday, Nov. 6 because of gunfire taking place across the Rio Grande. Anyone who needs to come to campus or has questions about events can call Campus Police at 882-8232 or 882-8233. Homecoming activities for Saturday, Nov. 6 have been affected. Coffee with the President has been canceled. The Golden Scorpions Reunion at noon will be on the patio at Lolas Bistro at 1335 Palm Blvd. in Brownsville. The Distinguished Alumnus Award event has been postponed until further notice. Enrollment Management’s Scorpion Saturday event has also been canceled. The mens and womens soccer semifinals of the Red River Athletic Conference Tournament have been moved to the Brownsville Sports Park. The womens game that UTB/TSC is playing in is at 8 p.m. and the mens game that UTB/TSC will play in is at 10 p.m. today. The womens soccer final will take place at 5 p.m. and the mens soccer final will be at 7 p.m. Saturday, Nov. 6 at the Brownsville Sports Park. It is dangerous on this side of the river too.